The Egyptian revolution that led to the ouster of its ruler Hosni Mubarak had a ripple effect in China, as crowds of people gathered in Beijing and Shanghai, apparently to stage anti-government demonstrations but were dispersed after the police detained some of them. Several thousand people rallied in Moroccan cities today demanding political reform and limits on the powers of the king, the latest protests demanding change to have rocked the region. Security forces in the Libyan city of Benghazi killed dozens of people as they fought to crush an uprising against leader Muammar Gaddafi’s rule, the bloodiest of multiple revolts now rocking the Arab world.Witnesses said Benghazi was in a state of chaos, with government buildings ransacked and troops and police forced to retreat to a fortified compound, from where snipers picked off demonstrators. The leader of Yemen’s secessionist Southern Movement was arrested in Aden and shots were fired at a demonstration in Sanaa today as unrest hit the impoverished Arab country for a ninth consecutive day. Several hundred gathered in front of a McDonald’s restaurant in Beijing’s Wangfujing Street today afternoon apparently after a message circulated by a US-based website calling on people to launch Egyptian style protests against the one party rule in China. People started to gather at around 2 pm on the busy shopping street in downtown Beijing, and together with onlookers and foreign journalists, the gathering people were numbered in hundreds at their peak, according to a witness. Today’s protests were the first visual action by dissident groups, which appeared to have been galvanised after the jailed prominent dissident, Liu Xiaobo was awarded Nobel Peace Prize, which was strongly resented by China. Interestingly the protests were reported by the English services of the state run Xinhua news agency. When the police on patrol tried to take away two men from the crowd at around 2.10 pm but they were surrounded by foreign journalists with their cameras, it said. In Shanghai a similar crowd gathered at the People’s Square. Three persons from the crowds were taken away by police the news agency report said. A man aged around 30 started to deliver a speech at around 3 pm at the intersection of Yunnan Zhong Road and Hankou Road but left when the police came. Later, the crowds gradually dispersed, the report said. 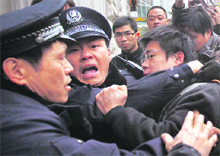 These protests were unprecedented by China’s standards as no anti-government protests were allowed. China is abuzz with rumours of ‘Jasmine Revolution’ for the past few days as the protest Egyptian protests spread to several Gulf countries. Some reports even spoke of arrests. Both Liu and his wife who was kept under house arrests were not allowed to go to Oslo to receive the prize. Later reports said several academicians who openly expressed support to Liu have been removed from service or detained but there was no official confirmation about it. China effectively blocked most of the social websites like Face Book and Twitter but several managed to log to them through US based Virtual Private Networks, (VPNs). Over 2,000 persons took to the streets of the capital Rabat, 4,000 according to the organisers, shouting: “The people want change.” In Casablanca, the North African nation’s biggest city, over 1,000 people came out demanding: “Freedom, dignity, justice,” an AFP correspondent reported. The demonstrations were peaceful as of midday. “I want a Morocco that’s more fair and with less corruption,” said a student demonstrator in Casablanca who asked not to be named. “We’ve got nothing against the king, but we want more justice and work,” said another student who gave his name as Brahim. Thousands of young Moroccans have joined the “February 20” movement on the social networking site Facebook, calling for peaceful demonstrations demanding a new constitution limiting the king’s powers and more social justice. Ahead of the protest, Morocco promised to inject 1.4 billion euros in subsidies to soften price hikes for staples, a key factor among others including rampant unemployment behind the spreading unrest in the Arab world. Security forces in the Libyan city of Benghazi killed dozens of people as they fought to crush an uprising against leader Muammar Gaddafi’s rule, the bloodiest of multiple revolts now rocking the Arab world. Witnesses said Benghazi was in a state of chaos, with government buildings ransacked and troops and police forced to retreat to a fortified compound, from where snipers picked off demonstrators. In the Gulf kingdom of Bahrain, thousands of anti-government protesters camped over Saturday night in a Manama square. But after days of violence in the Sunni-ruled island state, the mood appeared to be more conciliatory with talks due to take place on Sunday between the opposition and the crown prince. 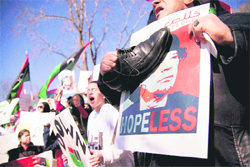 In Libya, Gaddafi responded to the biggest challenge of his four decades in power with ruthless force. New York-based Human Rights Watch said security forces had shot dead at least 104 persons, based on interviews with witnesses and hospital officials. “We are in the midst of a massacre here,” a witness told Reuters in Benghazi. The situation was confused as the Libyan government has restricted media access and blocked some communications, including the Internet. However, protesters appeared to have taken over much of Benghazi and security forces had retreated a fortified compound in the town centre, from where snipers were shooting at people. In Bahrain, Crown Prince Sheikh Salman bin Hamad al-Khalifa, who is emerging as a leading player among the ruling elite, made conciliatory noises after days of unrest that left six dead. “All political parties in the country deserve a voice at the table,” Crown Prince Salman told CNN before talks with the opposition. “I think there is a lot of anger, a lot of sadness ... We are terribly sorry and this is a terrible tragedy for our nation,” said the prince, who is seen as a reformist. Speculation was growing that Prime Minister Sheikh Khalifa bin Salman al-Khalifa will be replaced by the crown prince, who has pushed aside for now the hawks in the royal court. Thousands of people also staged sit-ins in the cities of Ibb and Taiz, demanding the departure of President Ali Abdullah Saleh, who renewed his call for opposition parties to pursue a dialogue with the government. Saleh, a US ally battling a resurgent al Qaeda wing based in Yemen, has held power for 32 years in an Arabian Peninsula state that faces soaring unemployment, dwindling oil and water reserves, and chronic unrest in northern and southern provinces. Hasan Baoum was arrested in the southern port city by an “armed military group” in a hospital where he was receiving treatment and was taken to an unknown location, his youngest son Fadi Hasan Baoum told Reuters. Baoum was also arrested in November last year, accused of planning illegal demonstrations. Security in Aden was stepped up on Sunday with tanks and armoured vehicles out on the city’s main streets. In the capital, as many as 50 government supporters tried to break up a demonstration outside Sanaa University by more than 1,000 protesters. Both sides fired weapons on Saturday outside the university-the first reported use of firearms by demonstrators. Several protesters were hurt in those clashes and five people including young girls were wounded in the southern town of Sheikh Othman, apparently by stray bullets.